Steven Soderbergh is back from retirement but the audiences don;t care much. This is Logan Lucky! IMDb summary: Two brothers attempt to pull off a heist during a NASCAR race in North Carolina. Logan Lucky was written by Rebecca Blunt – either a newcomer writer or somebody, working under a pseudonym. There has been speculation online that Blunt lives the UK, while some critics thought that Soderberg himself is hiding underneath that name (because he does that when crediting himself as a cinematographer (as Peter Andrews) and editor (as Mary Ann Bernard). Anyways, whoever this Blunt person is/was, they did a good job on the script. While the core narrative was quite familiar (Hell or High Water-esque – stealing for one’s family), its execution in details was brilliant. The movie opened with a good set-up of the mundane lives of its characters and established them as people, whose lives did not turn out the way they planned (one of them peaked in high school, the other was suffering from the little brother inferiority complex). Then, Logan Lucky moved on to showcasing the American culture (the kind that foreign people wouldn’t even dare to call culture), which consisted of children beauty pageants and rural county fairs. However, the star of the said culture and the film was NASCAR – a very American brand of motor-racing. The cherry on top was the prolonged anthem scene. Logan Lucky seemed to be driving home a message, that stuff like this, for better or for worse, happens only in the USA. This type of portrayal could have easily come across as annoying but the underlying sense of irony and satire made it work. Speaking about the comedic side of Logan Lucky – it was great if not as extensive as I hoped, after watching the trailer. I loved the different pairings of the criminals (The Hitman’s Bodyguard–esque) as well as the jokes that were central to the characters (one-handed bartender, the dumb brothers of Joe Bang). Logan Lucky also had a really funny sequence with Sebastian Stan’s driver character (who didn’t seem like he had much to do with the actual plot of the film). Another magnificent and hilarious sequence was the prison riot and the prisoners demanding all GRRM books, getting frustrated that ‘The Winds of Winter’ has yet to be released, and hating the fact that the TV show is going off books. The ‘explosive device’ sequence and the decision to stop midway and explain the chemistry were extremely funny too. Logan Lucky also had a surprising and really heartfelt scene involving the main character’s daughter’s beauty pageant and the song ‘Take Me Home, Country Roads’ (by John Denver). That scene should have been the closing images of the picture. However, Logan Lucky did continue and had a concluding detective story that felt like an afterthought. The investigation itself was not that interesting or neccesary. However, that closing sequence did provide some revelations about the main character’s secret dealings and did have a nice ending (well, for now) with all of them sitting in a bar. Steven Soderbergh (The Ocean’s trilogy, Magic Mike series, Haywire) did a good job with Logan Lucky but I don’t think that this was his best film. The pacing at the start was a bit slow, however, the movie did pick up its pace, when the action began. However, it started dragging again with that detective-story afterthought. What I appreciated the most about Logan Lucky (and the other films by Soderbergh) was that it felt real. Not necessarily realistic but real, grounded, self-aware, and sprinkled with irony. While the scripts that he directs (or even writes) are usually mainstream, Soderbergh addresses them with unique auteur/indie perspective. This time around, Soderbergh also approached the distribution of the film uniquely and decided not to partner with any of the big studios. Well, that backfired. Big time. Logan Lucky didn’t win its weekend, nor it showed any staying power by dipping lower and lower in the TOP 10. I really want to know who/what is to blame. Are the audiences just not interested in Soderbergh’s work anymore? Was it the lack of advertisement? Where were all the NASCAR fans? Where were all the grown-up Pixar’s Cars fan (the ones who saw the 2006 film as children and are now adults)? Where were the fans of movies, involving cars, a la Baby Driver? Logan Lucky had a really strong cast, lead by a new favorite of Soderbergh’s – Changing Tatum (they worked together on Magic Mike, while the other recent Tatum’s films include Hail, Caesar!, The Hateful Eight, Jupiter Ascending, Jump Street). His brother was played by Adam Driver, who is constantly working on smaller, more art-house pictures in between his Star Wars gigs, like Midnight Special, Silence, and Paterson. Daniel Craig (Spectre) also had a very fun role in the film that he seemed to be having a blast while playing. He never appeared to enjoy being Bond that much and, yet, he still signed on to continue being the 007. The supporting cast included Riley Keough (Mad Max), Katie Holmes, Katherine Waterston (Fantastic Beasts), and Hilary Swank (would love to see her going back to the Million Dollar Baby type of projects and the level of success). The majority of them didn’t really play real characters but were used as devices for world-building or the lead’s character development. Seth MacFarlane (Ted, Sing) and Sebastian Stan (Marvel stuff, The Martian) also had cameo roles and their whole separate thing going on in the background. In short, Logan Lucky was an enjoyable mixture of mainstream and indie, but it didn’t offer anything too special. Neither a disappointment nor really a win for Soderbergh. In preparation for Fantastic Beasts and Where To Find Them!!! Fantastic Beast and Where to Find Them is coming out in less than a month, so in order to get myself ready for its release, I decided to read the extra Harry Potter material that I missed or didn’t get a chance to read before now and I would like to share my thoughts on it. I have always been a huge fan of the main HP series, I have re-read all the main books more times than I can count – they were literally my bible growing up and kinda still are now. Harry Potter fandom was also the first fandom that I’ve ever joined. The last movie of the main series – The Deathly Hallows Part 2 – marked the first time when I genuinely cried in the cinema because I didn’t want to leave that world behind. As a kid, I would also imagine myself in that world – I used to play pretend that I was a student at Hogwarts, even made a wand out of two pencils and some tape. My mom’s bathrobe worked well as the uniform robe too. Nowadays, I express my inner fan of HP more subtly – I have a Hogwarts Alumni t-shirt, a Fantastic Beasts t-shirt, a Ravenclaw pin on my bag and a Time-Turner necklace because a)I would love to turn back time (although, The Cursed Child kinda made me doubt that) and b)I’m basically a muggle reincarnation of Hermione Granger. Plus, I recently order a Golden Snitch bracelet. Last year, I have also visited a few outdoor filming locations – the bridge that was used as the Hogwarts Express viaduct (Glenfinnan Viaduct) and the lake that doubled as the Black Lake (Loch Shiel). I made a blog post about that trip, you can find it here. Next spring, I plan on going to the actual tour of the studios in London as well as the King’s Cross. Okay, that’s enough of my personal story, let’s now discuss the textbook that the upcoming movie was inspired by as well as other extra books from the HP world. 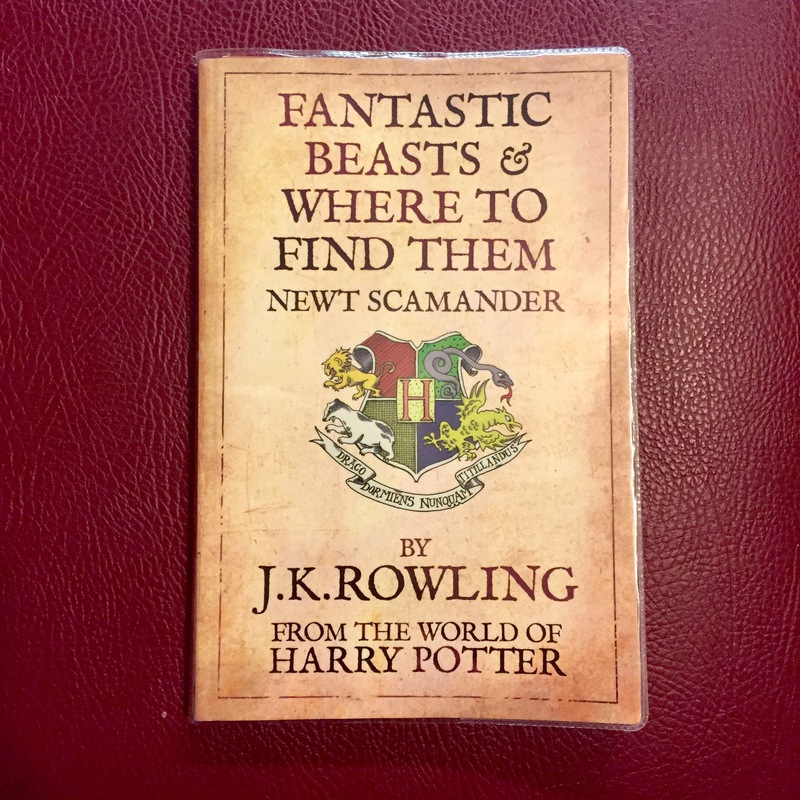 Fantastic Beasts and Where To Find Them, written by Newt Scamander a.k.a. J.K.Rowling is an amusing little book. It was first published as a novella for the UK charity Comic Relief in 2001, so the number of the printed books was quite limited. I managed to get one copy from a local library because I didn’t want to spend a lot of money on it – the books from the first few printings are super expensive on eBay and their prices have been increasing steadily because of the upcoming movie. The book will be rereleased next year as a hardback but who wants to wait that long? Recently, Warner Bross and J.K. Rowling announced that Fantastic Beasts franchise will have 5 movies in it. The original book consists of less than 100 tiny pages but I can see a lot of potential in it. You can basically just pick one beast that is described in it and come up with an adventure story revolving around it. I also imagine that the filmmakers and J.K. Rowling, who will be writing or at least overseeing the scripts, will pull some extra stuff from the Harry Potter lore on Pottermore or from the other 2 short novellas (which I will discuss bellow). Moreover, since J.K.Rowling is so involved in the creation process I don’t have any problems with her coming up with new stuff – all the fans were super happy when the HP 8th book was published. Fantastic Beasts not only has a lot of cinematic potential but it is an extremely easy and enjoyable read by itself. The novella is funny, witty and has quite a few easter eggs in the form of Harry’s or Ron’s handwritten notes. Another Comic Relief book from 2001, Quidditch Through The Ages also has a lot of cinematic possibilities just like Fantastic Beasts. I can definitely see this novella being adapted into a magical sports drama. I think a lot of people would be interested in this type of property, as the Quidditch scenes from the HP films have always been well-accepted. In addition, I think a lot of fans (I included) were quite disappointed when the filmmakers cut the majority of the Quidditch World Championship from the 4th film. 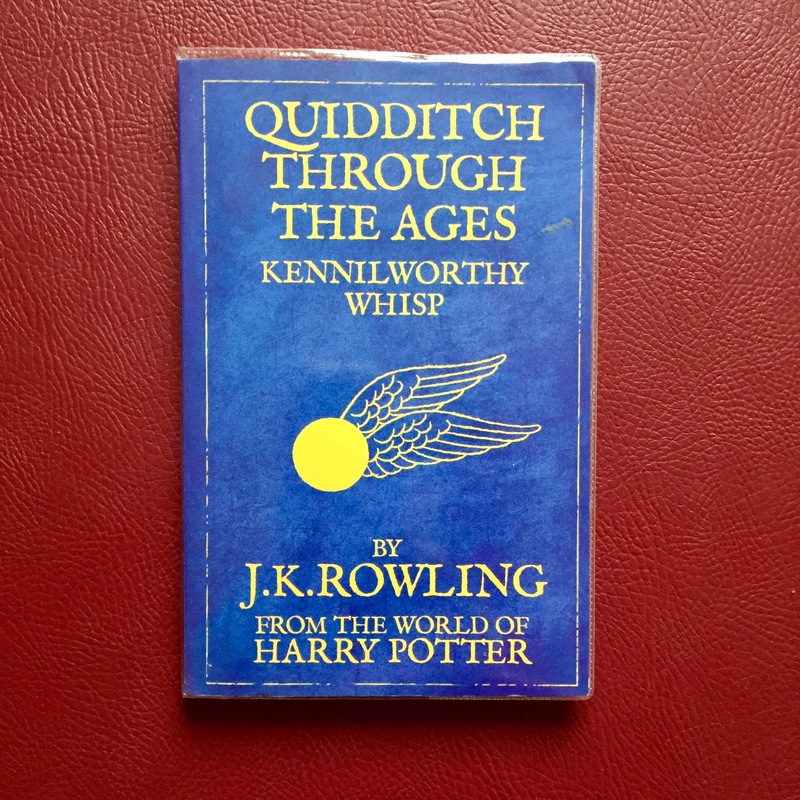 On a side note, Quidditch Throughs The Ages also did a very good job in adding a global aspect to the magical world, as it spotlighted the traditions of Quidditch around the world. I even found out that my native country of Lithuania has a Quidditch team in J.K.Rowling’s mind, called Gorodog Gargoyles. I was so excited after I read that paragraph that I’ll almost let it slide that Rowling used words with Russian language roots (‘gorodo‘ means ‘city‘) to name a Lithuanian team (my country’s and Russia’s common relations are not great due to history). 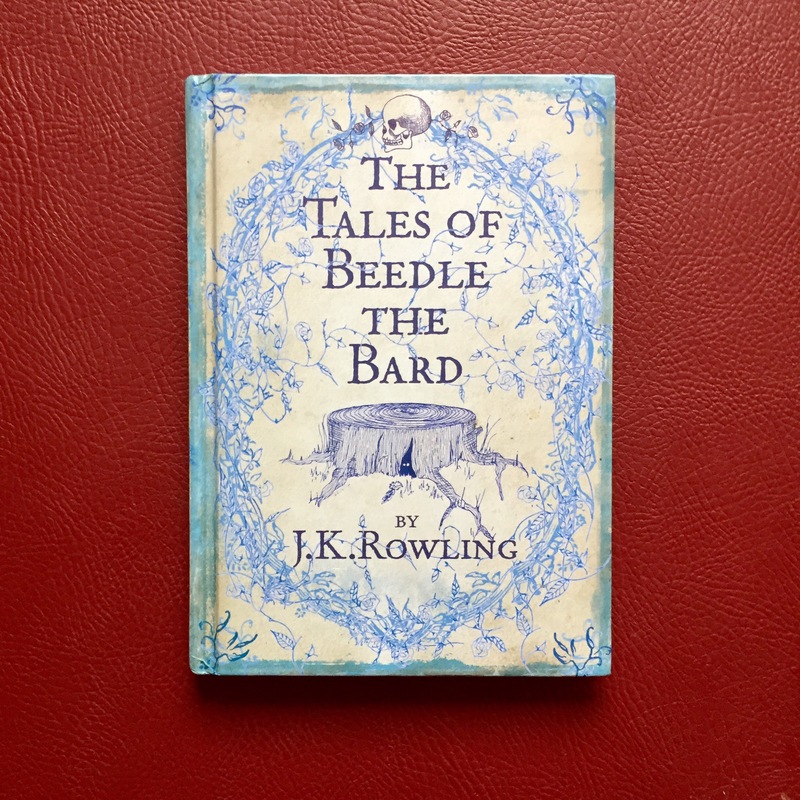 The newest of the charity books, The Tales of Beedle The Bard has been published in association with Children’s High-Level Group in 2008. This short story collection is J.K.Rowling’s magical take on the old-school fairytale genre. Among other stories, the book includes The Tale of the Three Brothers – a myth that played an important role in the final HP book. The short novella also contains Dumbledore’s notes on various tales: these writings not only give us more context and background regarding the magical world but also provide an insight into Dumbledore’s personality. These notes might be useful in kickstarting a Dumbledore-centric film plotline, as it has been speculated that the young version of the character will show up in the future Fantastic Beasts movies. Finally, one last note on the charity books – I think that they are an amazing idea and that more authors should use their talents for writing to help others. J.K.Rowling not only created more stories for the fans of Harry Potter but actually did something good that will benefit people around the world. Basically, I hope more writers will try to cleverly utilize their fandom for philanthropy. The last of the books that I’m gonna talk about today is, of course, the new HP book. 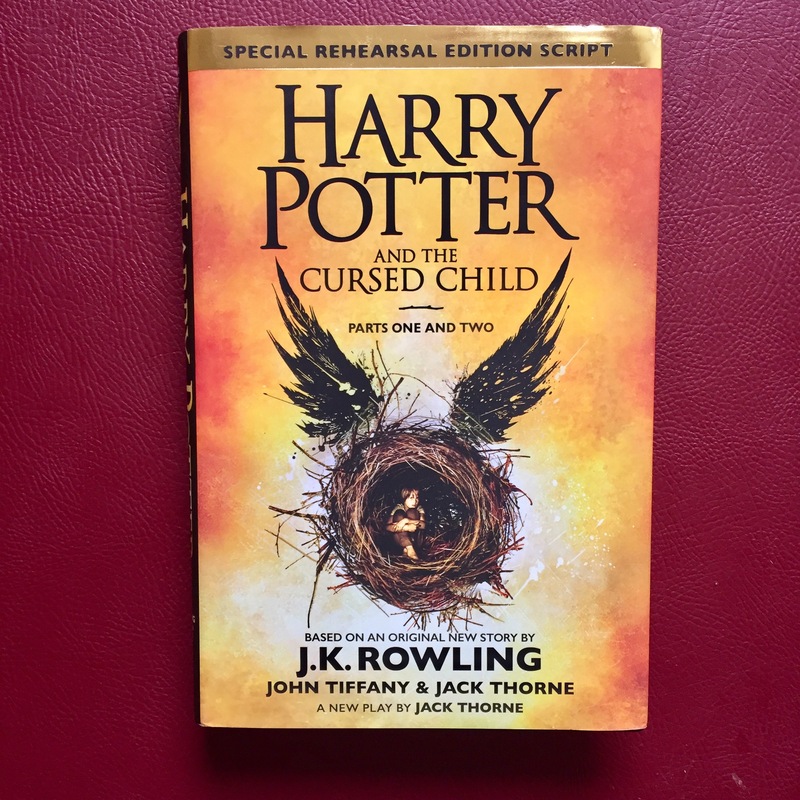 Written in a play format for the West End and released in a script form, The Cursed Child tells a story of Harry, his family, and friends 19 years after the demise of Voldemort. I was super excited when I heard that the script of the play will be published as I knew that I wasn’t going to make it to London to see the theatrical production. I absolutely loved coming back to this world and catching up with the character that I grew up with. It was also really nice to see them as proper adults: while their characters as children acted as my personal examples on how to be a child, The Cursed Child can basically act as my guide into adulthood. I also found it interesting how we got to see a few alternative futures of our beloved characters. In addition, I liked the fact that Rowling picked the Time-Turner from the 3rd book to be the focus of the 8th story – she has taken a supposed plot hole of a previous book and made it into a plot-point. Now, nobody can complain that they should have used the Time-Turner to kill Voldemort in the first place, as the consequences of that could have been even worse. Basically, the main message is DON’T MESS WITH TIME. Also, I liked how she took other familiar bits and pieces from the previous books and presented them in a new way, like the Triwizard Tournament from the 4th book. The format of the play took some getting used to, as the narrative would jump around in time very quickly. However, that added a quickness and a non-stop pace to the plot, which was quite nice and different. Nevertheless, I did miss the extensive descriptions that would take up a lot of space in the previous novels. The main topics and values like family, friendship, the fight between good and evil, the sacrifice, and the prophecy – the staples of HP – were present and welcomed in The Cursed Child as well. A few last notes of the book: I really liked how J.K. Rowling managed to resurrect popular characters for the 8th book, by that, I, of course, mean Snape. Reading his lines and imagining Alan Rickman in my mind made his passing even sadder and more heartbreaking. To end this short review on a happier note – I liked how in this book, Draco and Ginny were kinda included into the main trio. This reminded me a lot of the 5th book, which was my favorite because it had more of the main characters. Don’t get me wrong, I have always loved Harry, Hermione, and Ron together, but I also liked seeing them interact with other characters as well and The Cursed Child gave me more of that. After reading a new HP story and 3 supplementary novellas, I feel quite prepared and in the mood for the new film. I loved the casting choices, especially Eddie Redmayne in the lead, I’m excited about the new U.S. setting and the trailers have also been promising. My review of the film will be coming out the same weekend as the movie hits theaters. Bye, and Thank You for reading! Welcome to the last sports update post this summer. Well, it’s technically no longer summer, but, to me, the autumn doesn’t start until I leave for Scotland and that’s only happening on Tuesday. Anyway, today’s entry is dedicated to another running event I participated in – in my native language, it’s called Azuolyno Begimas which loosely translate to Oak Grove Run (it is held in an Oak Grove park). This is the 4th running competition of this kind and it usually happens twice a year – at the beginning of autumn and at the start of spring. All of the participants (around a thousand of them) could choose from a variety of distances. The professional runners or more athletic people were able to run 15km, 10km or 5km, while the beginner runners and amateurs could try their hand at a free 3km Fun Run. There were also special distances for pupils, kids, families, and pets with their owners. This particular run was quite special and interesting because I did something that I’ve never done before – I ran two distances in a single day during the same event. I did the 10 km distance – wasn’t really happy with my time or the state of my legs and feet – and I also accompanied my aunt on her first ever run – we did the 3km together. The second run was much more pleasant – not only shorter and easier but way more enjoyable too – I liked helping my aunt achieve her own personal goal. The weather for running was quite good – the temperature was around 15 degrees Celsius and it was quite cloudy, so the sun wasn’t shining into one’s eyes or adding any unnecessary heat and warmness. However, by the time I was finishing the 10k, it started to rain which wasn’t that great or comfortable, especially when running with glasses. All of the runners received their runner’s numbers and commemorative wooden medals. The participant’s package also included a discount card for hummel sneakers, a free entry to a sports center, a month’s subscription to an online exercise platform, an energy drink and a pot of quickly preparable porridge. Since I’m going back to Aberdeen in a few days, I will miss out on quite a few running events in my native country. In a few weeks, a memorial run organized by a local university will be held, while a week after that there will be a walking/hiking event. The first week of October would have been reserved for a charity run to raise awareness for breast cancer if I was still living in Lithuania. However, I’m excited to get back to the UK and to start a new year at university. I also hope to find some running events in my ‘other’ hometown. 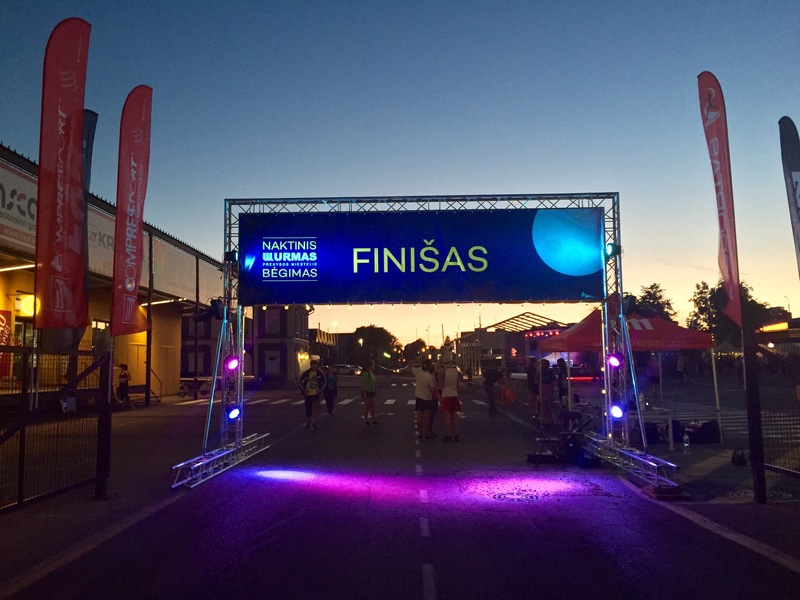 About a month ago, I told you about a charity night run that I participated in. Well, yesterday, I did another night run and I would like to share this experience with you. 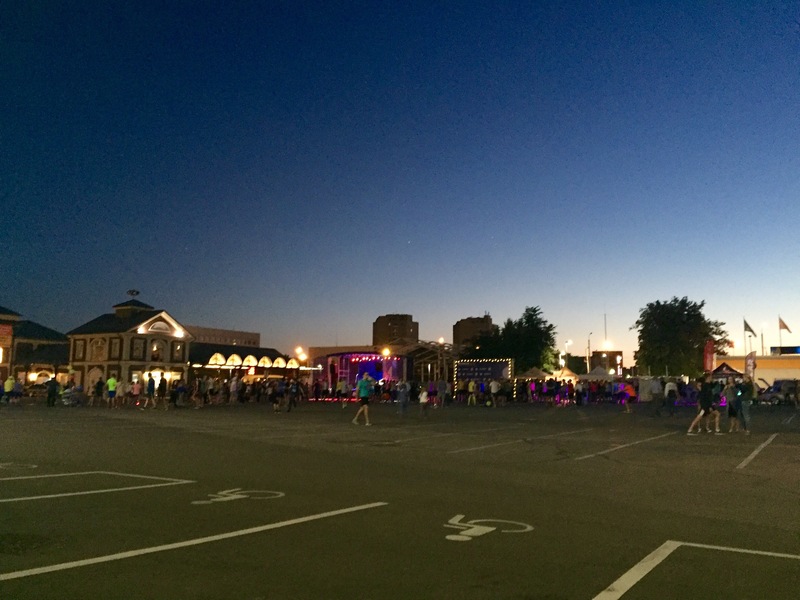 This particular night run was organized by the same people who arranged last year’s end of summer night run. 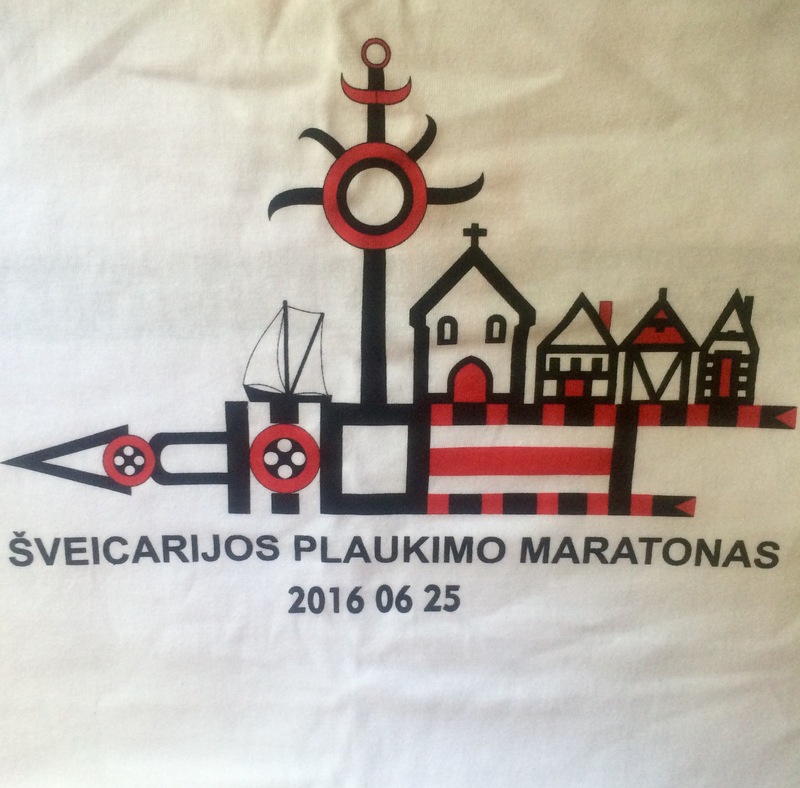 In 2015, all of the participants ran 8km: the route started in the Nemunas Island and spanned throughout the whole Old Town of Kaunas. This year, the athletes and running enthusiasts could choose one of two distances – 4km (2 laps) or 8km (4 laps). The location of the event was also changed – it was held in the closed territory of this outdoor shopping centre/hangar market, called Urmas. 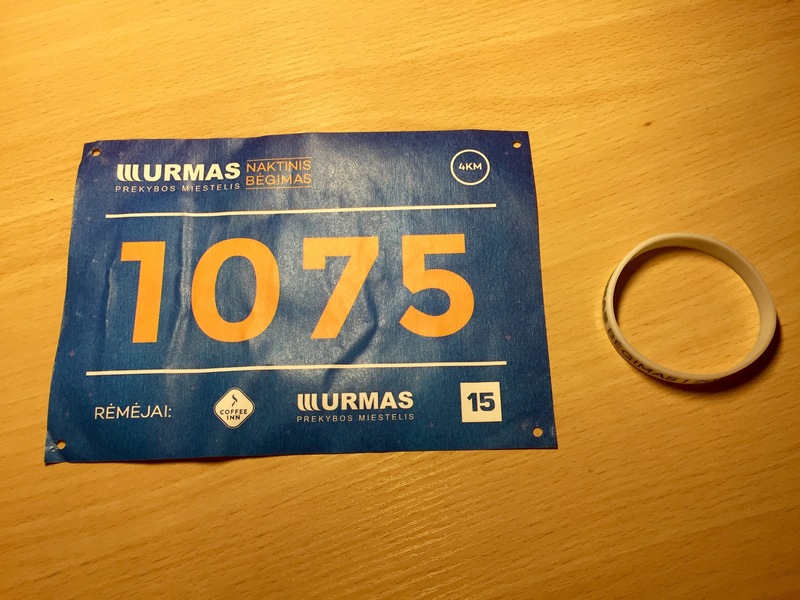 It is a popular shopping destination in Kaunas, so this whole running event was either a brilliant marketing scheme or a huge and lucky coincidence. It was weird running during the night because it was actually really dark – we only set off at 10pm. It was quite scary to run in a complete darkness during parts of the race – I was afraid I would hurt my feet or ankles. Other parts of the route had enough lights to run safely. 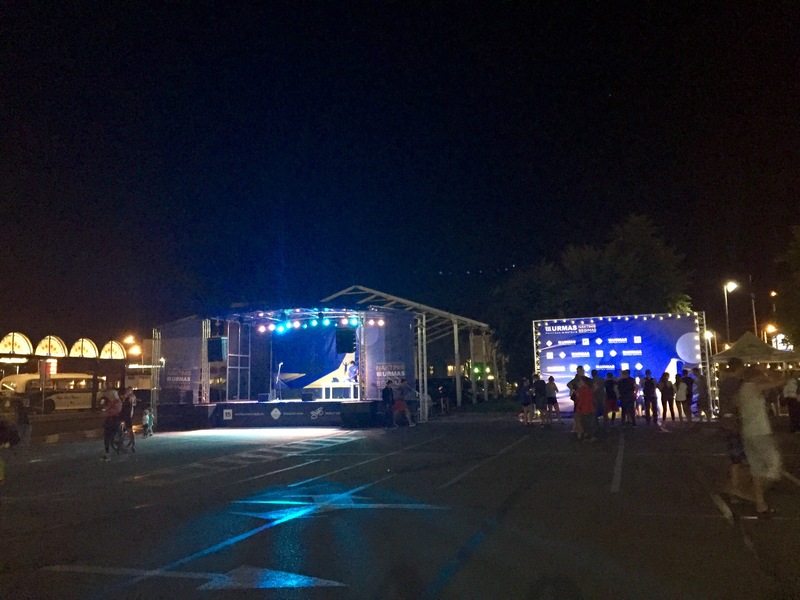 After and before the actual run, the participants could listen to live music or watch the laser show. All of the runners, on top of receiving their runner’s number, got glow-in -the-dark bracelets. 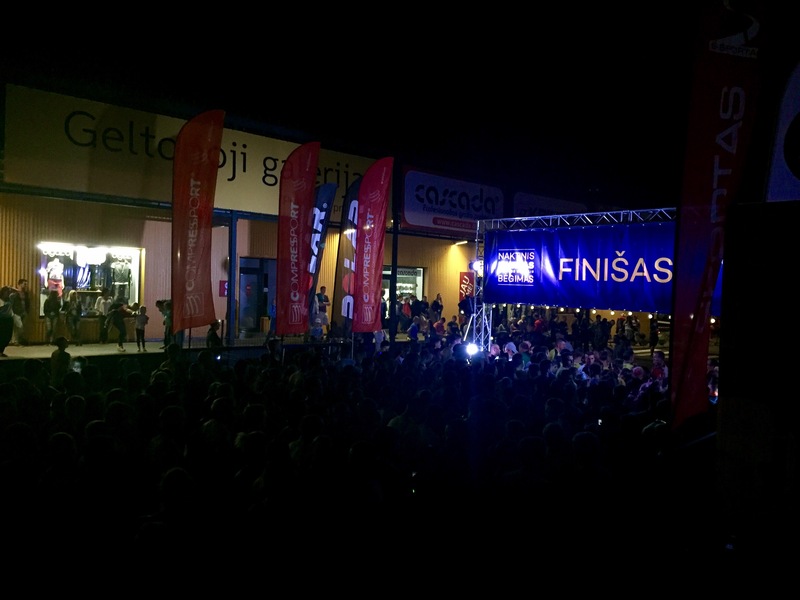 The start signal of the run was really cool and fitting for the night run – it was a firework! Nobody wanted to run as soon as it started – everybody wanted to fully see it before setting off on the run. I did the 4km distance and was quite happy with my time. This run was more like a rehearsal run for a big competition I’m participating in next weekend. I enjoyed running my small distance as usual. I’m not the fastest runner but I always love the feeling I get after I finish the distance. Bellow, I will include some photos from the event and the video of the start signal – the firework. Welcome to another short sports update post in-between the summer movie reviews! On Saturday, I participated in the 35th Annual ‘Platelee’ Swimming Marathon. To me, personally, this was the 7th marathon of this kind. 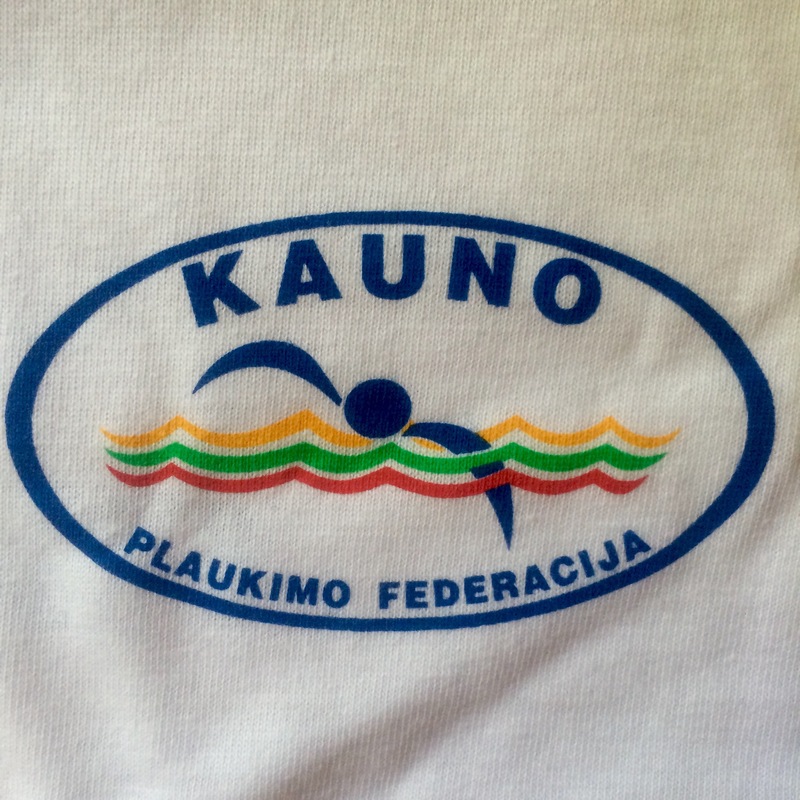 I’ve already told you about my experiences, swimming in this open water competition, in 2014 and 2015. Plateliai lake and town have a very special place in my heart and I usually both long and dread coming back there for a variety of reasons that I won’t be getting into. Thankfully, this year, the longing part of me won and I actually had a great time. I had a chance to spend a day with my friends, which I don’t see for 9 months. I was able to make new memories, which I will cherish for many years. I had an opportunity to try out my swimming skills in freezing cold water. I, once again, overcame my physical limitations and finished the distance faster than last year and was 3rd in my age group. The sponsors for the event were quite generous since it was the 35th anniversary of the Swimming Marathon. 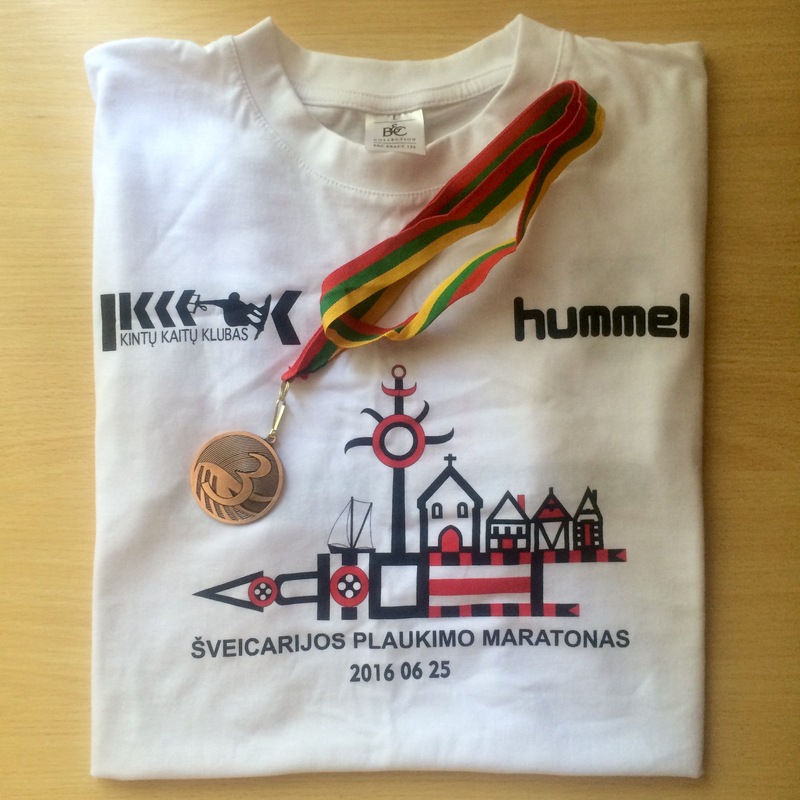 All the participants received commemorative glass statues, T-Shirts, stickers, and certificates. Winners were awarded medals and cups. 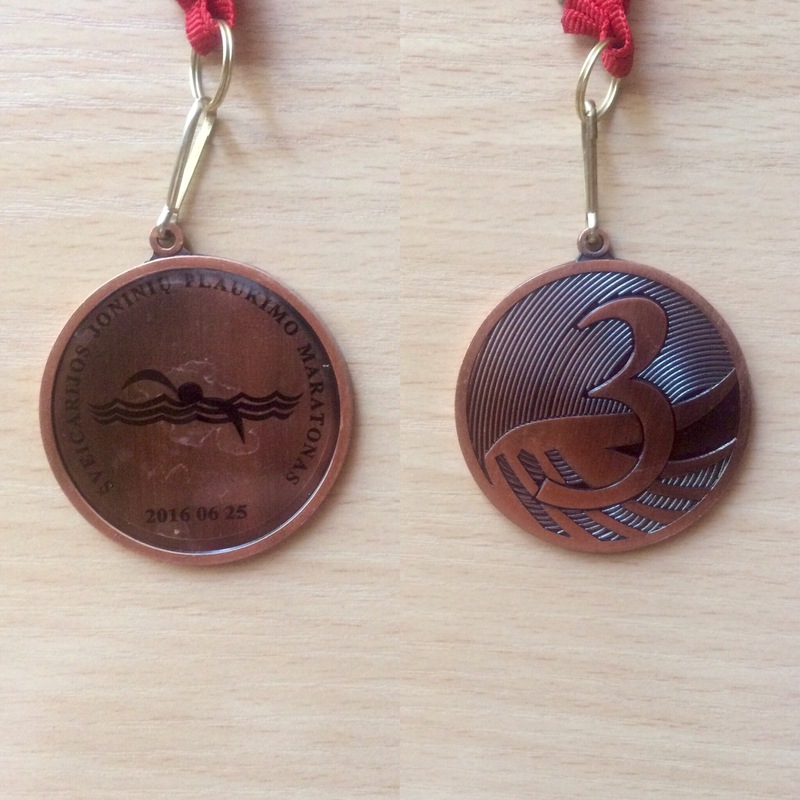 I still have one swimming marathon left this year and I have already done two: 1st|2nd. Sorry for over-dramatizing the post – I’m trying out new writing styles. Bye! This is just a quick update post for those who actually read my writings about sports events (thank you, BTW)! I started my 8th open water swimming season by participating in the 7th annual Swiss Swimming Marathon. The marathon was started in 2010 and I haven’t missed a single one of them. Usually, the water in the lake that the athletes swim in is pretty cold but this year it was perfect. Definitely above 23 degrees Celsius. The weather was also amazing: hot (35 degrees Celsius) and sunny. Swiss marathon’s distance varies year by year (depends on the water temperature). This time, we competed in and completed the full 2,2 km distance. It is not the official length of the open water marathons but it’s enough for the majority if not all that of the participants. Since I haven’t trained at all, I was happy to just finish the distance and didn’t care much about my result. Nevertheless, I still came in 3rd in my age group (photo of the medal bellow). 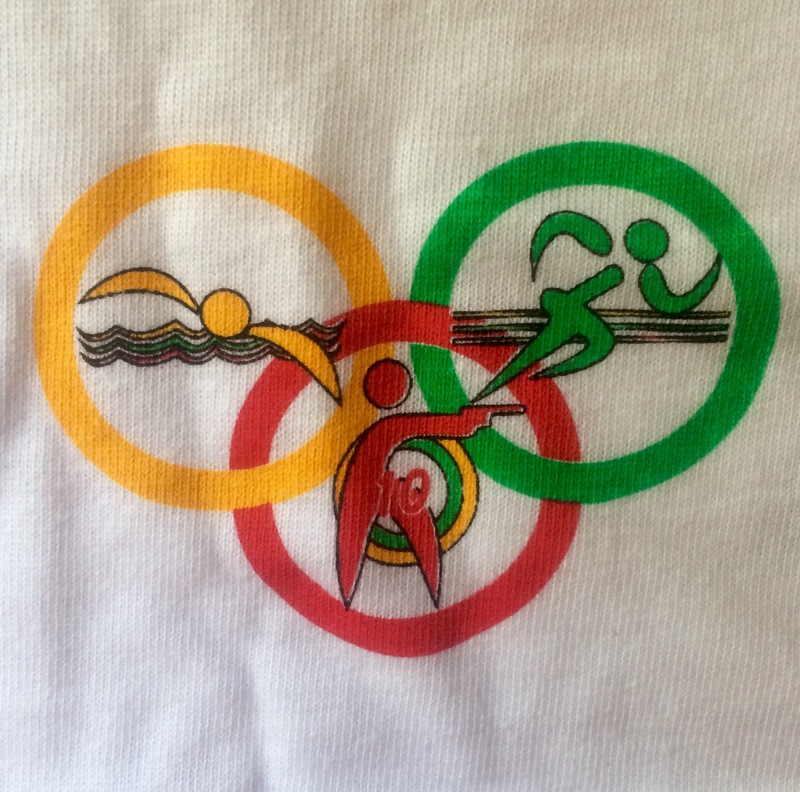 All the swimmers also received official T-Shirts, so now I have 7 almost identical tops. I wish they would change up the design. Athletes, who didn’t want to swim the 2k distance, could participate in the triathlon competition (shooting, 2km running, and 200m of swimming). Disabled swimmers could try out their skills in the 300m swim. Overall, I had a great time swimmer the marathon as well as catching up with one of my friends by the lake. You can find more photos from the event here. If you want to check out my previous posts about this marathon, you can read about my experiences swimming the Swiss Marathon in 2014 and 2015.